I’ve read two New Zealand novels recently that have on their covers walls of dense bush with arch-shaped escape-routes in them, through which can be seen the light at the end of the tunnel. First, Patrick Evans’ superb, mimetic Gifted, and now this layered and original novel from Emma Neale, Fosterling. On the Neale cover, a tall, fuzzy, uncertain-looking man walks away from the camera, framed by the arch. But he is really walking toward us, the reader, Kiwis, living just beyond the bush. The New Zealand undergrowth, it seems, whether suburban or back-block, continues to deliver a range of fictive mysteries to us, from literary icons, to pig-hunting blokes, to tutus-and-gumboots, to the unlikely Tarzan Presley, to tall hairy beasts. These characters, the invention of the bush or of those who live alongside it, come shyly into the light. In Fosterling, a yeti-like creature called Bu, seven feet tall and covered in a thick pelt of glossy hair, emerges from deep, dark South Westland bush. Initially mute, he inspires a media circus, but also draws out tenderness and compassion among the small group of people who try to protect and care for him. As Bu’s story unfolds, we learn to liken him to a sasquatch, to Big Foot, to a maero; he creates a connecting tissue of universal myth set here in New Zealand. And we wonder, mesmerisingly, where he came from and what will happen to him. The novel’s set-up is somewhat like a detective novel that sifts through events to discover a truth. Sandrine (the name summoning shifting qualities) is a small-time suburban newspaper journalist, down on her luck, jilted in love by the flashy, media-savvy Jake, and with an ambiguous sidekick called Faber. True to the detective mode, Sandrine is ‘different’ – in this case a disability, a foot which didn’t grow right, which she is sometimes self-conscious about, and which seems at first to be at least part of the basis of her interest in Bu. Also detective-like, Sandrine unwittingly exposes Bu to harm — the self-serving vices of Jake, who plasters Bu all over the news. Sandrine and her various accomplices must then take Bu into hiding. At this point the novel turns a beautiful corner, from ‘Seek’ to ‘Hide’ and back again, and we are asked to consider possible versions of Bu’s beginnings, and of his true nature. The novel never forgets the myth-driven quest for identity and belonging at its core. These twists and turn of language are all in the service of character. Neale keeps the reader’s best interests at heart. She wants us to know, and in the end, we know about Bu and Sandrine. The two characters bounce off each other in expressive and poignantly guarded ways, with a hopeless semi-romantic wash. Sandrine is the first person to get Bu to speak. When he does, his ticks add much to his character and to our vision of him. Skin is ‘eh-skin’, ‘cover’ is ‘cubber’ — which Bu must do if he is to go unnoticed in public. Interspersed with these main-character investigations, Fosterling presents a sampling of minor characters who appear briefly and tell us, through third person, their impressions of Bu: there is the tramping couple who initially find Bu, a hunter who glimpses him, the psychiatrist who tries to treat him, schoolgirls who read about Bu in the media, even a choric ‘The Crowd’. They come and go, often too briefly (especially the last character introduced, who has information about Bu’s identity). In this ‘witness’ device, Fosterling strangely resembles Lloyd Jones’ Hand Me Down World (must have been something in the water), and it is about as effective. That is, the reader is pushed away by brevity, but can engage once there is time to invest in a character. 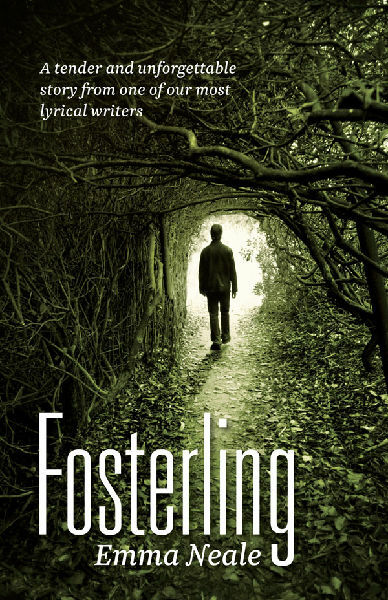 Fosterling is Neale’s fourth novel, and her most vibrant in both content and form. She is also a successful poet and editor, with a growing and interesting body of work, which to date has often concerned the domestic, the intimate, the time of day. Night Swimming, for instance, her debut novel, is a lovely coming-of-age story. Other works, including the novel Relative Strangers, and her edited anthology of parenting poems, Swings and Roundabouts, focus on family. Fosterling marks a departure, then, for Neale. While the novel has a backdrop of familial relations, lost relatives, lost love, and even a griping couple, its main protagonists are modernist but also very contemporary individuals searching for new connections and new ways of being in our dislocated and dislocating world. That said, the strongest section of Fosterling is that attributed to Bu’s alleged mother, who became cripplingly anxious and shy in her efforts to protect her son. In this glorious section, Neale writes with illuminating straightforwardness and tenderness. It is exciting to read a writer who engages with New Zealandness, with bush, small towns, isolation, with hybrid mythologies. If in some ways, Fosterling is less complete than her earlier fiction, Neale has attempted so much more. She demands our attention with this exhilarating account of what might lurk out there, how we might get close to it, and a warning of how we might fear it. ANNE KENNEDY is the author of the verse novels, Sing-song (which won a Montana Award for Poetry) and The Time of the Giants (AUP), and other fictions. She has worked in film, taught fiction and screenwriting, and is a co-editor of the online arts journal, Trout.